I got this for my birthday a few weeks ago and no doubt- I am in love. This dress and me, it was meant to be! I've been eying it for a while now, since we own a dachshund, Max. Everytime I wear it, I feel as if I am wearing "Many Mini, Manly Maxes" (Say that seven times fast! No, really, try it. It is what I said to Max all day long, poor dog! ) I chose to highlight the graphic patterns by going purely black and white with this look, and love the way it gives it a bit of a geek chic vibe. As a result, the most random people called out to say they like the dress- the person checking me out at the drugstore, the lady riding her bike, the lawn man. Oh, the power of puppy-related items, right? this look so super cute on you! 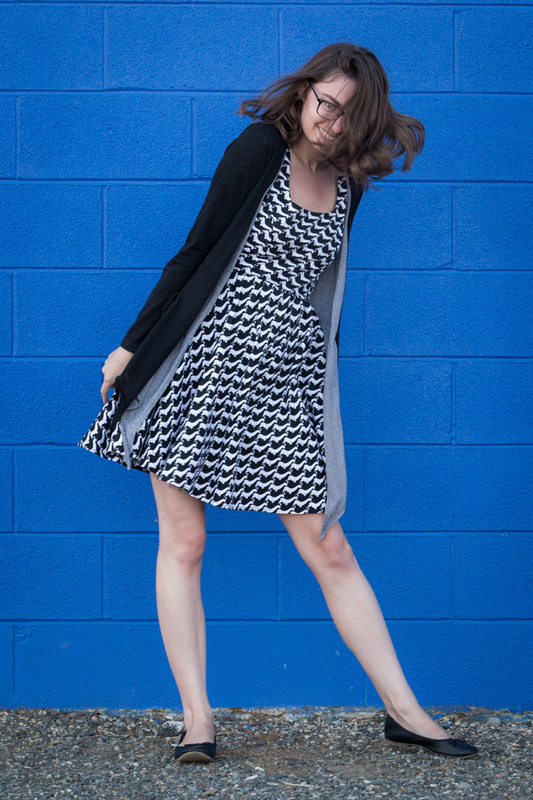 LOVE this dress and you're absolutely right-- it's so you! This blue wall is also amazing. Love how the coloured background makes your outfit pop! 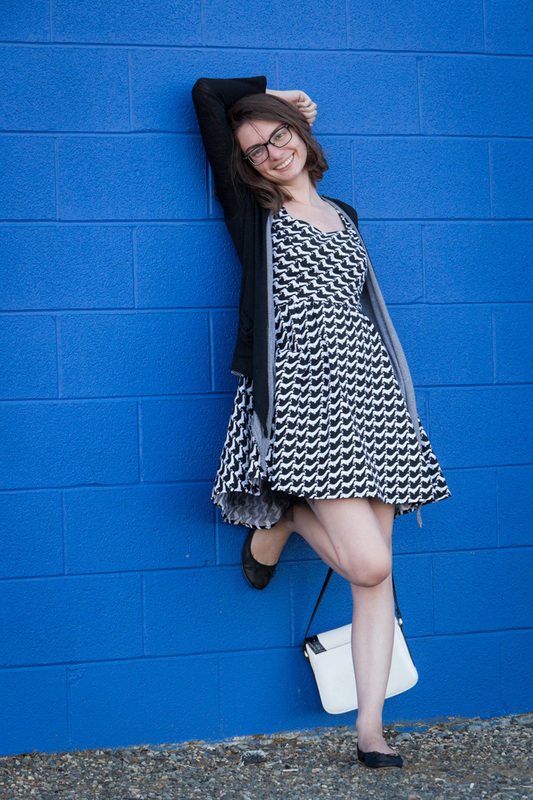 This pretty blue wall is the perfect backdrop for outfit photos! I love your dress, too! I have found that a few dresses from Ruche and ModCloth have strangely high waists. My girlfriend who is super short waisted can wear any of them and they all fit her perfectly. Me on the other hand...sometimes it seems like I might be wearing kids clothes. Describing it as feeling like it is wearing kids' clothes describes it perfectly! What a fun print, this is such a great piece and it looks fantastic on you!! Your dress is amazing- such a cool print and cut!! so cute on you! and woo girl, look at them legs - foxy! oh and happy belated birthday too! That is a really cute dress, and I love the simple styling. and most importantly, i LOVE seeing your big smiles here : ). The last dress I bought had the waist line at the ribs too. I was really concerned about it and had a conversation about it with the girl in the next changing stall, and she insists it's the style now! 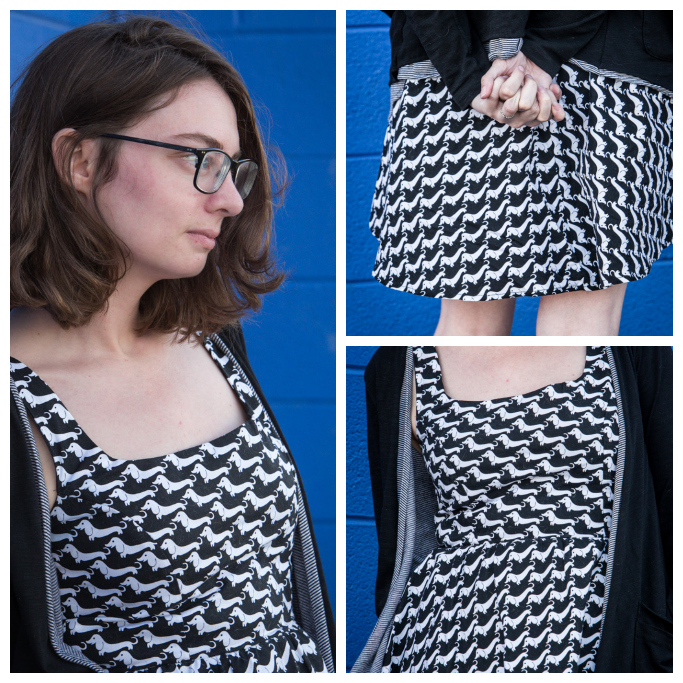 It only worked for me because the dress was mostly black- two other really cute patterns didn't cut it on my figure. I don't need anything that makes my legs look longer! But this one is adorable! puppies! Love the bouncy skirt with your bouncy hair!